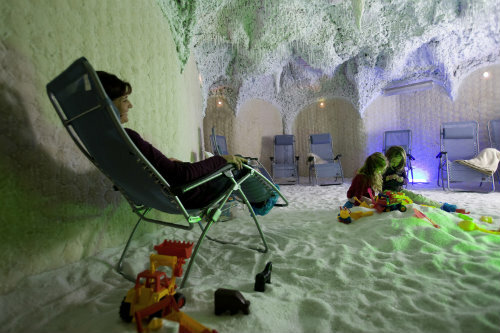 Take a deep breath and wind down in the Dead Sea Salt Cave in Bad Soden-Salmünster. The walls and floor of the Dead Sea salt Grotto in the Spessart Therme are made of Dead Sea salt bricks and bulk salt specially manufactured in Jordan. Because of its high air solubility the salt of the death sea is particularly suitable for inhalation. With a room temperature of 22 degrees and a humidity of maximum 50 percent the negative ions detach from the salt and enrich the air. 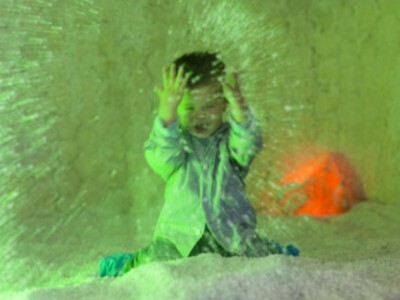 Therefore, a unique feel-good climate dominates the Dead Sea Salt Grotto, as it is otherwise only found by the sea itself. 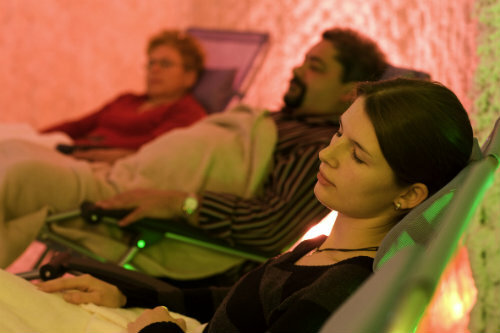 This can have a positive effect especially with respiratory problems, allergies and stress. In the separate grotto for children, the air is inhaled while the children are busy digging in the so called “saltpit” and pass the time with all sorts of toys. For more Information you can call the following number or write an E-mail.